For over 25 years the Choirmaster Ricky Dillard has been proclaimed as one of the most dynamic and charismatic Directors in Gospel Music! Delivering a list of never ending hits coupled with some of the most energetic and vibrant performances in Gospel music, Dillard has wowed audiences all over the world! Backed by his Award Winning and energetic choir New G, Dillard has broken the mold and created a new template for Sunday Morning and sound that is like no other! Amazing , the highly anticipated release was recorded live in Dillard s hometown of Chicago, Illinois and showcases the intense energy and creativity of the group. Amazing , the title track from the release, has secured a top 5 slot on Gospel radio charts and has become the fastest growing single in the group s history. Keeping in the tradition and signature sound of the group, this release is filled with animated and energetic tunes like Grace and Everything . The title single Amazing introduces a new sound but keeps with the signature flare and vigorous delivery of the group. 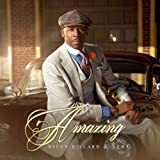 Ricky Dillard and New G maintain their post as leaders in the realm of Gospel music and give old and new fans a new songbook for Sunday morning!